Rorisite: Mineral information, data and localities. From Latin, "roris," for "dew." Unstable in air, leaving a residue of fluorite. 3.DC.35 Aravaipaite Pb3AlF9 · H2O Tric. 8.4.4 Korshunovskite Mg2Cl(OH)3 · 4H2O Tric. 8.4.6 Tachyhydrite CaMg2Cl6 · 12H2O Trig. 8.4.8 Sinjarite CaCl2 · 2H2O Tet. 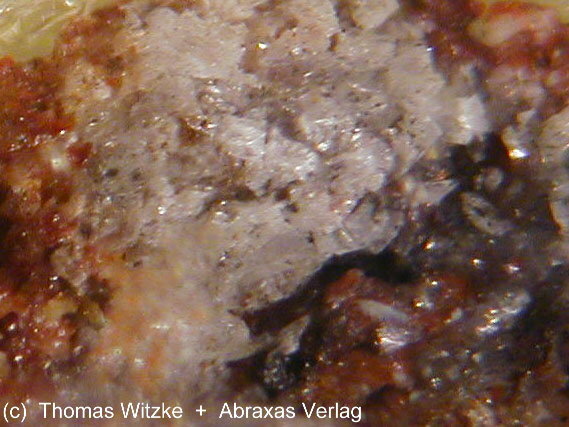 American Mineralogist (1991): 76: 1731. Zapiski Vserossiyskogo Mineralogicheskogo Obshchestva: 119(3): 73-76.